Can I lovingly call you out on this? Listen, I love to work in solid chunks of time. If I'm blocking time on my calendar for a project, I'll aim for 90 minutes or two hours. Uninterrupted time is optimal for being productive, no doubt about it. Life isn't always optimal though and I believe in taking action when and where I can. Consider a particularly busy day I had last week. I had a full schedule of calls between coaching clients, podcast interviews, group programs and meetings with project partners. In the midst of this, my nephews arrived for a long weekend and my granddaughter was dancing in circles all around us. In spite of being pulled in many directions, I knew one thing: an email needed to go out! I arranged for 15 minutes of peace and put my fingers on the keyboard and got it done. Sure, it was a short email – but it was out being read by my community within minutes. What can you make happen with small chunks of time tucked in here and there through your day? Follow up on a interview opportunity. Post a reply to a conversation in a niche community. Curate a resource for your people. Send a thank you note to someone you've learned from recently. Even these tiny activities move your business forward if they are tackled with consistency. Stop Using Lack Of Time As An Excuse! 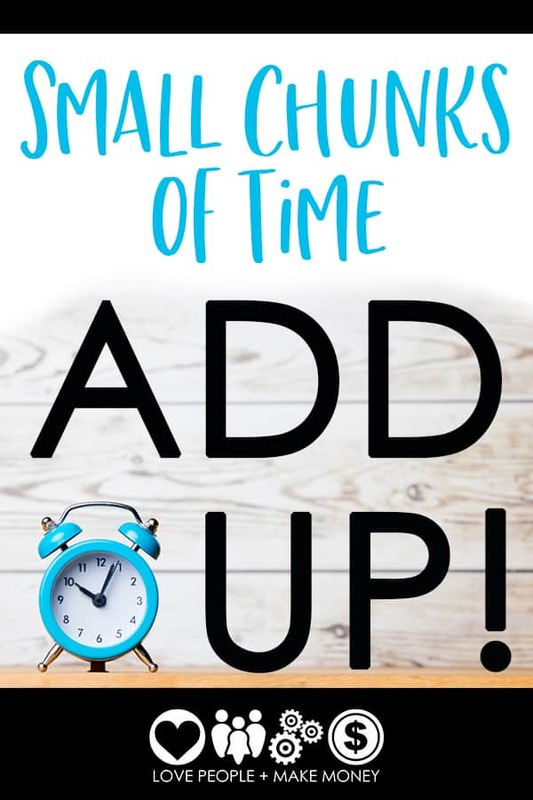 If you're crazy busy and feeling like you can't get anything meaningful done, use your next small chunk of time to break a project down into bite size action steps – then use the next few small chunks of time to cross them off your list. Whether it takes days or weeks, something WILL get done eventually and that's better than the alternative! I find I can do far more than I imagine if I just take a first step. I know you will too! Kelly, thank you for your simple no-nonsense encouragement to get me motivated. tiny bites of time are available. I just needed a calm voice on my phone to get me going! You’re welcome! Let me know what you get done with your next tiny bite!